There may be a tiny bit of moaning in this post, a bit of more-than-usual whinging about the children, mostly due to my terrible advanced pregnant-ness and the hormones and the tiredness and the ligaments and the endless demands for toast and the constant maiming… Just a heads-up. Feel free to read no further and go find a pleasant blog with nice stories to tell and photos of creative ways with origami paper. I would. My breakdown has slowly unfolded since we returned from Turkey – The Land Of Husband-On-Holiday-&-No-Domestic-Crap-To-Deal-With. It is still school holidays, and the weather has been gorgeous, and mostly I really like the kids, and spending time with them and doing holiday stuff and sleeping in and bumming around, doing touristy things and watching movies and mainlining ice cream. But then,at some unspecified moment, the goodness/badness delicate balance topples over spectacularly and you find yourself weeping by 9am. Yesterday, in a typical almost-good-day we walked back from the park where there had been no sand-throwing or dramas with strangers or lost children requiring the help of the police over a decent period of three whole hours, and so we walked to Oddonno’s for gelati as a high-five to us all. We got there, the kids order raspberry and mango sorbets, vanilla and salted caramel, we sit at our usual booth overlooking the ice-cream-makers through the big windows, and then Casper starts kicking the other kids’ legs and then they kick back, and soon they are all on the floor, writhing and kicking and yet, skillfully, attempting to finish their ice cream, all at the same time. So we leave immediately, I tell them off in my now-usual-public-shouty-voice and I take them to Marks & Spencers for milk, because we have none, and we need some for the morning, as they do love their cereal. We get as far as the first Fruit On Offer aisle, and soon they have tackled each other to the ground and they are kicking and there is a security guard looming over them and then a checkout lady rushes up and looks around for the mother (who has lost her sunglasses in the violent fall-out and is actually primarily concerned with gathering them up, because they are a very nice Tom Ford ebay number and it is glarey outside) and then I notice the scuffle and the crowd and I pull them apart, like you have to do with locked dogs, grab as many hands as I can and we march out, but not before shouting at them (again, all loud and spittle-fuelled) that they will not get ANY CEREAL IN THE MORNING! At least, it shall be DRY MILKLESS CEREAL! And you will all be going into your room and there will be no TV and no iPad and there will be NO CHOCOLATE AND CHURROS TOMORROW FROM THE SPANISH CAFE BECAUSE YOU HAVE EMBARRASSED ME ONCE AGAIN BY BEHAVING LIKE BRATS! 5% of those moments where everyone is being charming/cute/funny/intelligent and compliant. 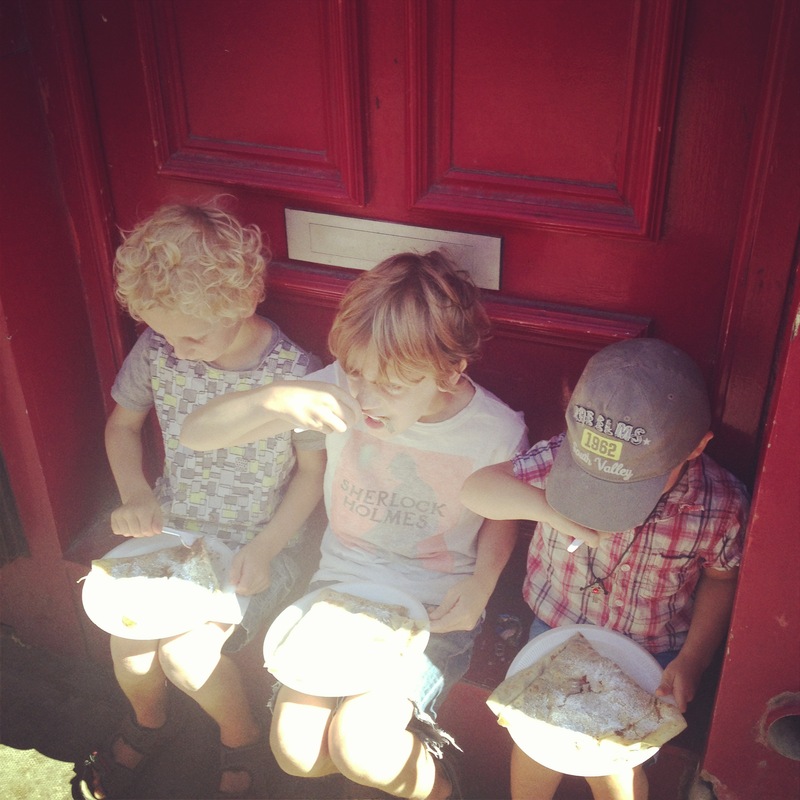 Like below, a snatched snap of happy kids in the Portolbello Road sunshine eating nutella and strawberry crepes in a “rockin’ your neighbourhood” kind of way. 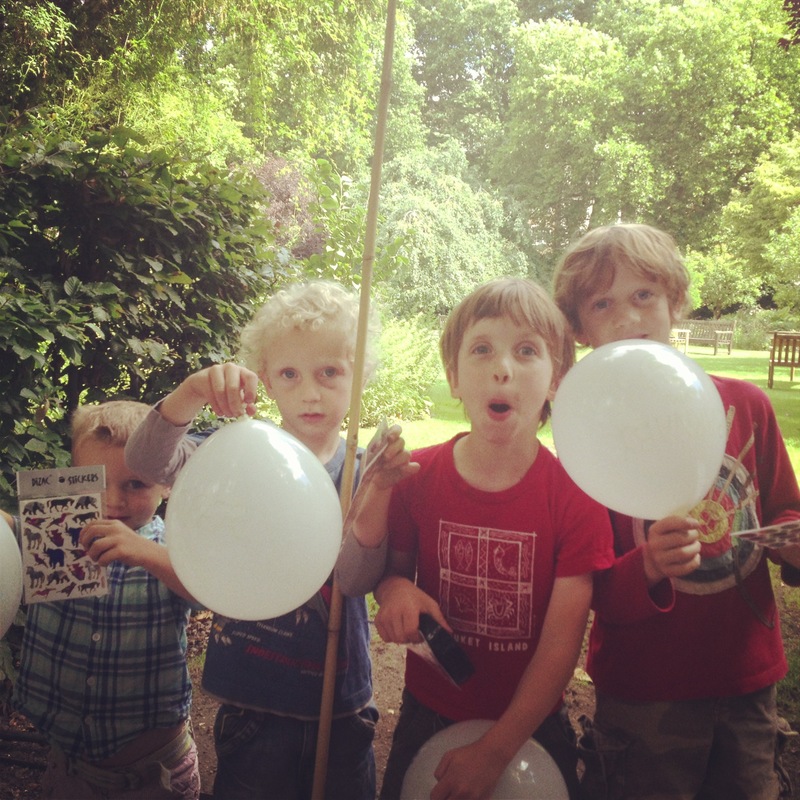 And here, in the garden, when nana and granddad sent balloons and stickers and baby blankets for all, and they were enchanted and distracted from the usual default position of wrestling and crying. But thats a scarce 5% over 7 weeks. Think on that, fellas, think on that. And there has been one solitary but fairly dramatic incident of dog-and-kid-walking that went wrong, involving the usual supermarket shopping traumas and one lost kid and the others who fight in front of oncoming buses which resulted in me getting home, running to the bedroom and sobbing and muttering “little bastards!” in a soft, defeated, choked up way. And, incidentally, wondering where my audience was, because what’s the point in meltdowns when you are on your own? But I did tell everyone about the sob-fit, which went some way to making me feel better. BECAUSE I AM 39 WEEKS PREGNANT! And all this stuff is HARD! Aaaand this morning, there was fighting, and so I banished one kid to the bedroom, and in his rage he threw stuff around the room and broke my beloved 1940’s British Rail tiny child’s chair which I use everyday to hang out the washing. So, no milk, no clean clothes, more crying from me. Then I came out, accidentally broke a glass, broke down again, told the children through my snot that I can’t wait to be laid up in hospital bleeding with engorged bosoms and stitches with a new nameless baby because I CAN HAVE A REST FROM ALL THIS AWFULNESS! They looked a little worried. DISCLAIMER: There may be something in the repeated crying that is related to pregnancy hormones and thus an incapacity to deal with things in my usual robust way, and maybe the lack of sleep owing to the useless bladder and huge stomach that suffocates you with its weight and girth, and the new cough that splutters out of my throat as soon as I relax, so I will give you that. Anyway, I went off to Aveda to drown my sadness and resentment and got my brows blackened and my hair yellowed, all of which causes Mark to wince just a little bit. Here is me, eyebrows hidden in shame, nose looking mighty, but the face is a face of calm, because for three hours no one spoke loudly to me or tried to steal food or tipped anything over or hurt anyone. There was just whale music and massage and magazines. I could live there. I think there is a hint of detectable sadness at returning home underneath that fluffy composure. So, I have about a week to go before that new baby squeezes out and life has to rearrange itself around the mewling infant. And school goes back, and Ned returns to nursery a few days a week, and I have to stop avoiding chores like lifting stuff and doing bookwork. And, the stupidest thing of all stupid things, is that I will miss those little buggers terribly, and I will start longing for the next holidays. I is mental, innit. Here’s some authentic tweaking at the Notting Hill Carnival. 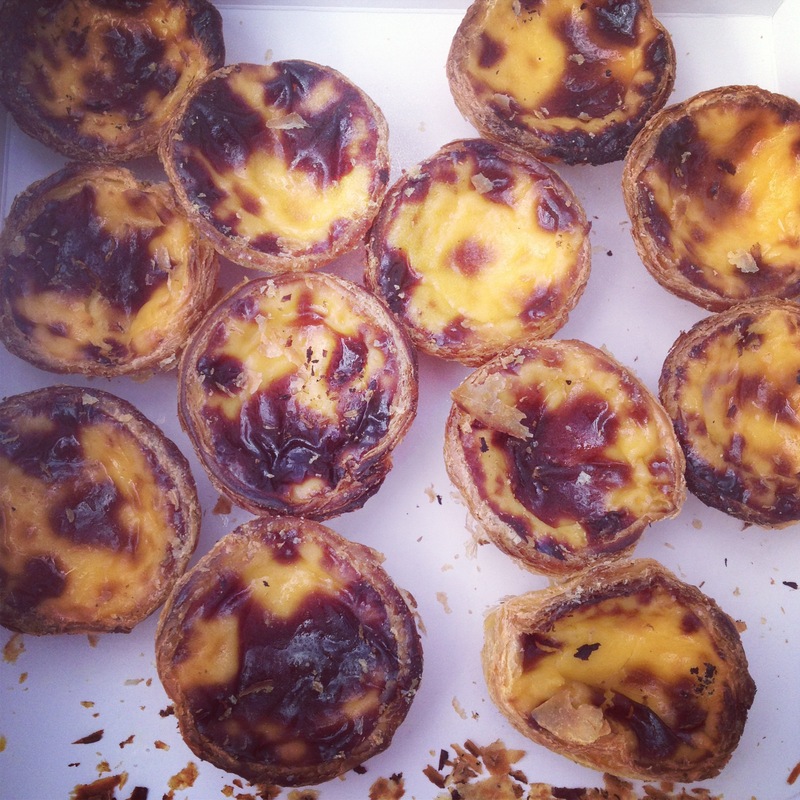 Here are pasteis de nata from the Lisboa Patisserie on Golborne Road – a kind of thick, lemony custard tart from Lisbon. These are extraordinary. We bought 20, ate them fast, then returned to buy another 22. 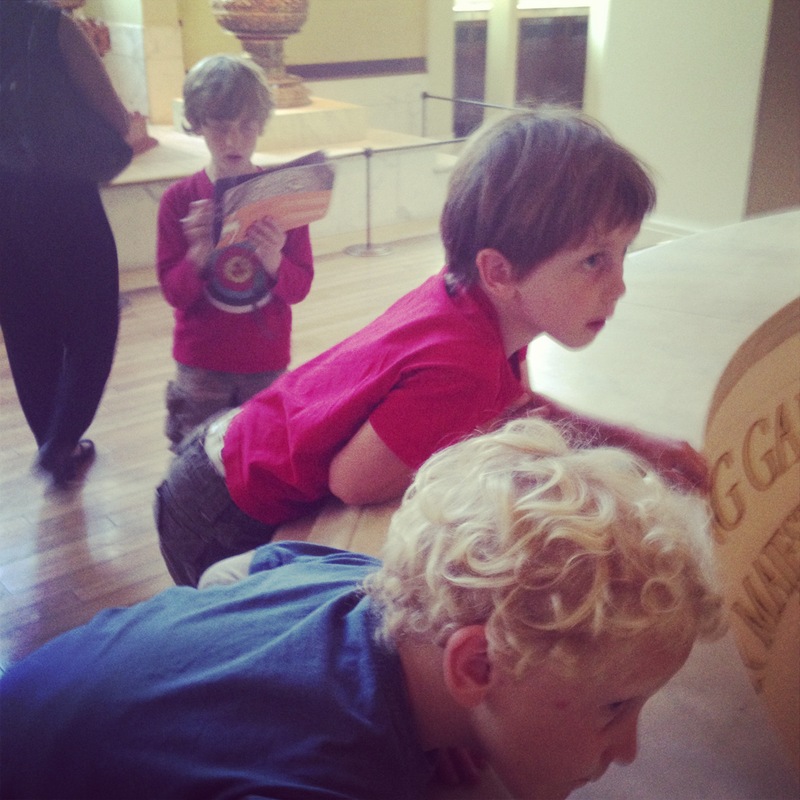 A brief visit to the British Museum to follow a kid’s trial, before it descended into chasing each other around the Indian wood carvings and a bit of dangerous climbing onto marble light wells. It ended at Pizza Express with some unfortunate fisticuffs. Enough of my parental woes. My next post shall hopefully be photos of a nice baby with a reasonable name, nothing rhyming or chavvy or comically themed. Until then! I remember those days so well, pregnant and shouting and weeping with small children and not pregnant but still shouting and weeping. I used to lie down on any available piece of floor that wasn’t covered in toys, bowls, beakers or nappies and just wail until the little sods were forced to ask if I was OK. When they were older, I’d slam the front door dramatically and shout “I’m off. See how you like THAT.” Now that the children are almost grown up, I do actually miss those shouty, weepy days, but not the terror of wondering if today would be another day when there was blood from another fight to be mopped, or another broken toy to be lamented. Calm, of a sort, descends gradually. Now they just fight with words, mostly about stuff I don’t understand and shouting is rare. Thank you for that – you make me feel normal and not quite so unable to cope! I have had better days. I cannot BELIEVE they won’t have mani pedis with you! The ingrates!!! Yours give my three a run for their money! I don’t even have pregnancy hormones to account for my tears of frustration at my hideously behaved kids. It’s so reassuring to know I’m not the only one in tears! This is the best therapy! You look awesome in your post Aveda picture. Gorgeous and really cool. I cried on Sunday (fathers day) because of the 5am wake ups and the unending tunnel of child doom I felt I was in. And I only have the one. And I’d started crying BEFORE he accidentally punched me in the eye. Thank you, beautiful Horhay! You always look gorgeous in your photos. And thin and about 17. How’s the eye, post Ted-punch? while I do feel your pain…the way you put it into words generates a big smile on my face. One day you will read this blog back to your self and smile too. Empathetic high fives cyber heading your way. And Good luck for the upcoming birth…and some peace and quiet from the big boys. Can’t wait to hear the birth announcement. You are a legend. Four little devils and still keen for more! Which makes me think they must actually be sweet and snugly underneath all the horror stories! Love your blog and hope you won’t be on maternity leave too long!! Jane, predictive typing. Same as for ‘trial’, not ‘trail’. I was aware, but too busy crying to correct! Actually, I might qualify as a stapler. I’ve just finished reading your whole archive, in between shouting and weeping at my own two small dictatots. (That was a typo but I think dictatots is more accurate somehow.) Good luck for the birth and beyond! Oh my merry hearty, you make me jibber with laughter when I know I shouldn’t. JIBBER, I tell thee. Oh I can’t wait to hear what you name your baby as we have totally similar tastes. In fact we named one kid the same as you and your other three names were on my list last time. This time, at 26 weeks, I am struggling although started making a list. But I betcha one jam tart that you choose a name I adore and it’s likely to be on my list. Although I will tell you now, I’ve taken off the following cos the Husband dissed them all: Maggie (reminded him of Thatcher), Camilla (Parker Bowles), Minnie (doesn’t work with our surname) Victor , Monty and Percy. I still bloody love Percy. Damn it. Will shout you a gin sometime if I am wrong and you choose a name that didn’t even enter my radar. Then we can drown our sorrows together. My little Prince pushed his big sis in a massive fish pond three weeks ago. The fish are gigantic. The Daughter screamed so loud I thought I would die and she lost a shoe and we had no spare clothes. Cos you don’t pack spare clothes for a TEN YEAR OLD….GRRRRRRRRRRRR! Good luck, can’t wait to hear the news. Ah, I’m totally with you on the struggling with names thing. Mark just vetoes everything I suggest but comes up with nothing himself, except truly awful ones. Like Blue. Urgh. Nameberry.com has been a good source of lists. I like Juno, Aurelius, Augustus, Roman and Billy….all rejected. 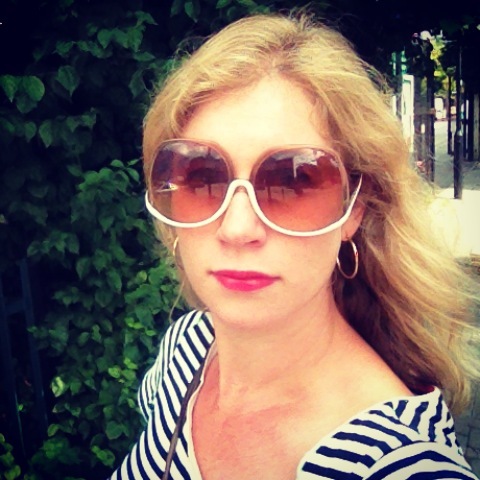 You look wonderful in your photo and I love reading about your family travails! In real life, of course, I would hug you and make you endless cups of tea. But because this is a blog, I laugh my head off whilst making simultaneous clucky I-know-just-what-you-mean noises. Good luck with the new baby when it arrives! Can’t wait to see the pix! Yep, those percentages sound spot on here too! Even lovely moments can turn sour quickly – just this morning an overenthusiastic hug from one sibling ended up with the hug-ee almost falling under a bus. Sigh.